Lazarus, the character whose name was given to this day can have various meanings. He is thought to be either the brother of Martha and Mary, who was resurrected by Jesus, prior to His entrance in Jerusalem, either Lazarus the poor, either „Lazarica” (a Romanian diminutive of Lazarus), who died craving for pies. According to a legend originating in Bucovina, once upon a time there were two brothers, one possessing great wealth, while the other, named Lazarus, could barely make enough money for living. The latter, in spite of his financial misery, had also contacted a strange disease, consisting of odious blisters that covered his entire body. The other people began to avoid him; even his wife left him. Meanwhile, the rich brother was thriving and he decided to marry, throwing a lavish party. Lazarus, however, was not invited. Desperate and starved, poor Lazarus went to his brother’s gate, imploring him for a place at his table. The rich man called him a beggar, denying the family relationship. Upon hearing this dreadful thing, Lazarus sat down and burst into tears. At this time the dogs noticed his misery and started to bring him food remains, fallen under the tables from the wedding party. The brother didn’t allow this to continue, commanding the servants to tie down the dogs. After the party had ended, when the guests were leaving, the fiddlers noticed Lazarus and, despite they knew he couldn’t reward their effort, started singing, reminding him of the times when he had a better financial status. Hearing the songs, the rich man went outside and began making fun of the fiddlers, telling them that all they would receive will be, at best, some blisters. When the fiddlers finished singing, Lazarus indeed rewarded them this way, saying that this was the only thing in his possession. Embarrassed, the singers accepted his gift. On their way, they noticed the blisters had transformed into golden coins. Cheerful, the fiddlers mentioned to Lazarus’ wife about what had happened. Angry, she went to her former husband, criticizing him and announcing her wedding to another man. Hearing all these things, Lazarus advised her to pray before she would leave her house, facing the four directions, each one at a time. However, in her wedding day, the woman forgot about the advice and left with her new husband, in his carriage pulled by six horses. But she reminded somewhere along the road and started to pray. While she was praying, she saw the horse and the carriage disappearing and noticed that she had arrived in strange lands. She realized then that her new husband was the Devil. Even if she had only traveled for some minutes, she needed three years for returning to her village. Meanwhile, Lazarus was dying. He asked his rich brother to help him, but this replied that he had no fear of death or God. Thus Lazarus died and the angels took him to heaven. Another symbol of this Saturday is Lazarica. In Walachia there is a custom called “Lazarel” or “Lazarica”. In the morning of this day, several 6 to 12 years old girls gather and choose the youngest of them. The chosen one will wear white bride clothes and will decorate her hair with jasmine flowers. The girls go to the houses of the village and they form a circle in the front of one of the windows. The so-called bride, also named “Lazarita”, sits in the center of the circle and makes a few steps back and forward. Meanwhile, the other girls are singing about Lazarus. The legend goes that he was a young man who had asked his mother to bake him bread. As she refused, Lazarus left for the forest with his flock. He climbed a tree in order to shake its leaves down for the sheep, but the branch he was sitting on broke and he fell to his death. His three sisters, seeing that he doesn’t come home, went searching for him. Finding him dead, they mourn him, bathed him in milk and buried him. Other version of the legend tells that Lazarus himself made the branch break. The girls who execute the ritual of “Lazarita”, also known as “bride”, are given eggs or money by the ones to whom they sang. According to another story, Lazarus was a little boy who was craving for pies. As his mother did not have enough time for baking him pies, the boy died, on a Saturday. His mother mourned him and asked God not to forgive the women who don’t bake pie in Lazarus’ Saturday. That is the reason for which the women bake pies on this day, doling them to the poor ones, especially to the families with little children. The pies are also baked in the memory of Lazarus the poor, who prays to God for the forgiveness of the human sins. In Maramures region a small wheat bread is baked. Also called “grain flower”, it is divided between the family members, as it is believed that the ones who taste it will meet again on the other realm. In Transylvania and Banat, in the evening of this day, girls place a mirror and the shirt they will wear the next day under a pear tree, so that the sun will rise above them. These objects are then used for love and health spells. This is also the time when the girls plant flowers, thinking they will grow quickly. For the same reason, in some regions fruit trees are not planted, as it is believed they will only make flowers, not fruits. It is also said that on this day the dead are awaiting at the heaven gates. A week before the Easter, the Flowers Day (Romanian: “Florii”) is celebrated. This was initially dedicated to the Roman goddess Flora, but then it was celebrated in the memory of the Jesus’ entrance to Jerusalem. This day is the celebration of the nature revival, when the willows, the fruit trees and the flowers bloom. The willow plays a very important role in the rituals. The legend goes that, while Jesus was crucified, His mother left, crying, in the search of her son, wearing iron boots and a steel rod. On her journey she arrived at a river and asked a willow to help her cross it. As the willow made a bridge for her, Mary put a blessing on it, stating that its wood could not be transformed into coal and that its branches would be taken to church every year. That is why, on this day people bring flowers and willow branches to the church, for being sanctified by the priest. With the willow branches, symbol of spring and fertility, cows and little children are touched, in order to grow and bloom as the willow. The holy branches are then placed near the icons or above the door and are used throughout the year as a medicine or for protection against the natural disasters. It is also believed that the people who wear the willow branches as a belt will not suffer of loin aches; who eats three catkins will not suffer of throat aches. The willow is also used in commercial purposes – before taking the animals to the market for selling, they must be touched with the willow branches, to please the buyers. Another use of the catkins is for protection against the storms and hail. In the summer, when the weather is bad, catkins are placed on the fire, so that the resulting smoke would drive away lightning and thunders. Anybody who swallows a sanctified catkin will be healthy and light as the willow flowers. People must not work on this day and the table must remain laid all the time. Even it is fast, fish may be eaten. It is also a day for commemorating the dead, when the burial places are cleaned and willow branches are put above. As it is believed the nettles begin to bloom, they aren’t used as food anymore, this being called the “nettle’s wedding”. The nettles, eaten especially during the fast, are considered a very healthy food. In some regions, “nettle’s wedding” is on Annunciation day or on the Thursday before the Easter. It is said that if the frogs can be heard until this day, the next summer will be beautiful. The weather on the Easter will be similar to the one from this day. The Thursday before the Easter is called “the Great Thursday”, “the Thursday of sufferings” or “the black Thursday”. Girls and women must finish sewing the new blouses for the Easter until this day. Otherwise they will be punished by Joimarita, a mythical woman who beats or burns them. She is believed to take the laziest girls at her home and eat them. Another (not so cruel) version goes that Joimarita spells those girls, so that they wouldn’t be able to work all the year. According to the Romanian tradition, skies, graves, doors of heaven and hell open this day. The dead return to pass the Easter near the loved ones. They will remain at their old houses until the Saturday before the Rusalii, when pies and bowls are doled for their souls. It is believed that the spirits sit on the roofs or in the yards. As it is still quite cold, fires must be lighted in the morning and in the evening, so that the dead could have light and heat. The fires are lighted for every soul or it is only lighten a fire for all the dead souls. The brushwood can only be gathered by children, pure girls and old women, a day before and only by hand (they must not be cut). On the way home they must not be let down and will be placed on a fence or on another object until morning, when the fire will be lighted. Chairs with blankets are also put near the fire, as it is believed that some souls will sit on chairs and other will sit on the ground. Girls and women carry water buckets to the graves or to the fire, for the dead that will sit there. Most of the women paint the eggs on the Great Thursday. In Walachia the eggs are painted on Wednesday and taken to the church on Thursday. They are let there until the Easter, as it is believed that they won’t alter. In other regions, twelve red painted eggs are taken to the church until the Easter and they are buried then at the village boundaries, so that the hail wouldn’t come upon it. Laundry can not be done this day, so that the dead won’t receive the dirty water, but the things that had been doled in their memory. The Friday before the Easter is called the Great Friday. Also named “the Friday of sufferings”, it is the day when Jesus was crucified. People don’t eat on this day, as it is believed that doing that they will be healthy and they will know they’ll dye three days before. The tradition recommends that you step on a piece of iron when you wake up, in order to be protected from bruises. If you bathe in the river before the sun rises, you won’t suffer from bone illness. In Bucovina it is said that who bathes three times in a cold river will be healthy all year long. People go to church to confess. Bread may not be baked, the earth may not be ploughed and trees may not be planted, as they won’t fruit. The Easter is the most important celebration of the Romanian people and it is preceded by numerous preparations and rituals. It’s a must for the people to have a clean house and have all the ritual foods ready. This is why the cleaning starts on Great Thursday. Men, who are usually working in the field or at the forest, will remain home starting with this day and will take out the thrash, fix the fence, cut wood, bring water, butcher the lambs. Women are the ones that paint and decorate the eggs, do the laundry and generally clean the house. Because it’s a good thing to have a new piece of clothing on the Easter, girls and young wives start to sew shirts for them and also for their parents, brothers, husbands or children, with about two weeks in advance. The eggs are painted starting with Thursday. Initially the only accepted color was red, but in time other colors were also applied – yellow, green, blue and even black. In the villages the paint is still obtained from plants. The eggs are usually first painted yellow, because the other colors will look better when applied over it. Blue painted eggs are an exception. In Banat, the first painted egg is called a „try”. In the Easter morning it’s shared between the children residing in that house. The yellow eggs, also called „galbineala”, „galbinare”, „galbinete” sau „galbinele” (in Romanian “galben” means “yellow”) are painted with an extract of wild apple tree bark and leaves, different kinds of willow or onion leaves. Red eggs, also called “rosele”, “rusele” or “rosetele” (in Romanian “rosu” means “red”) are colored with a paint obtained from red alder tree bark, cinnamon, oregano or amber. The paint for the green eggs, also called “verdete” (in Romanian “verde” means “green”) is obtained from pasque flower, sunflower seeds or nettles. The blue eggs, also called “albastrele” (in Romanian “albastru” means “blue”) are painted with an extract of sunflower, pasque flower and woods. These are boiled in borsch, in which bluestone had been put. These eggs are not first painted yellow, like the others, being directly obtained from white, unpainted eggs. The black eggs are also called “negrele” or “negrete” (in Romanian “negru” means “black”) and remind of the Jesus’ sufferings on the cross. The paint is obtained from woods, black alder and nut tree bark. These eggs are obtained from eggs first painted yellow and then red. 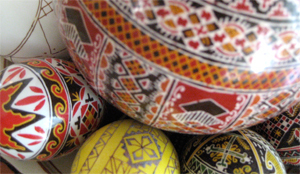 The most interesting traditional eggs are the decorated eggs (in Romanian they are called “oua incondeiate”, “oua impiestrite”, “oua inchiestrite”). Special instruments are used for decorating them. These take the form of very thin and round sticks and are called “chisita (bijara)”, “matuf (motoc)” or “festeleu”. The “festeleu” is a sharp stick made of beech wood. At one end it has linen or cotton little pieces. The “festeleu” is soaked in melted wax. In contact with the surface of the egg, little dots will appear. The most used decorative motifs for these eggs are: the lost path (on which the souls of the dead walk toward the judgment), the cross, the fir or oak leaf. In Walachia the saw and the plough are also drawn and in Moldavia the lightning and the fork. Various plants, animals and kinds of crosses are also drawn. According to the Romanian tradition, if on Saturday before the Easter you place an egg (on which you have drawn something every day, beginning with the middle of the Fast) on a garbage dump, you’ll see an animal (usually a dog) trying to take that egg. You shouldn’t let it take it, as it will return for it and grant you any wish you have. ”Pasca”, a special Easter cake, is baked on Great Thursday, but especially on Saturday, so it wouldn’t alter until Easter. It has a round shape (reminding little Jesus’ diapers) or a rectangular one (the shape of His grave). In some regions “pasca” is also baked on St. George Day. A legend from Bucovina goes that the “pasca” has been done from the times when Jesus was traveling to the world together with his apostles. They remained a night at a peasant house and when they left, he put food in their bags. The apostles asked Jesus when the Easter is and He replied that the Easter would be when they would find corn bread in their bags. Looking in the bags, they noticed the peasant had given them exactly corn bread, so that they knew it was Easter time. The “pasca” can be simple, with jagged margins, or it can have dough braids. The middle braid is cross-shaped, reminding of Jesus’ crucifixion. This is called a “cross pasca”. The simple “pasca” is for the family, while the “cross pasca” is taken to the church, in order to be sanctified. Small “pasca” (“pascute”) are baked for the little children. Among the ingredients are pot cheese, egg yolk, raisins and sometimes sugar and cinnamon. The shells of the eggs used for the “pasca” are thrown in a river. This action has two explanations. It is believed that the hens are protected this way of the hawks. The major explanation is, however, the ancient belief that the shells are taken by the river to the country of the Good People, announcing them the Easter has came. The cakes (called “cozonaci”) have a round or rectangular long shape, symbolizing Jesus’ grave. The traditional Easter lamb also symbolizes Jesus. In Banat region, the remains of the sacrificed lamb are buried under an apple or a pear tree, in order that the family should be healthy. Saturday night, when all the cleaning and preparations in the house are done, the steak, the pies and the cakes are put on the table, in the “clean room”. Before going to the church, people wash themselves in a bowl with water, where red painted eggs and silver and golden coins were also put. They believe that this way they will be as glowing and healthy as the eggs and they will be clean and will have more money, due to the silver and golden coins. After they clean and dress the new clothes, the people take a bowl with “pasca”, eggs and steak and go to the church, where the aliments will be sanctified. Only the ill old men and little children remain at home, as it is said that who can go to the church on Easter night, but he doesn’t do it, will get ill.
A fire is lighted near the church and it will be kept for all the three Easter days. In some regions, when the roosters announce the midnight, the man who watches the fire shuts with his rifle, calling the people to the church. The bells are also ringed at midnight. People hold lighted candles during the religious mass and only put them out when they return home, after they enter the house and make crosses. These Easter candles are kept for the times of danger, when they will have a protective function. At home, people first taste the anaphora and then sit to the table. They first eat some of the sanctified aliments and only then the rest. In some regions, rabbit or fish meat is first eaten, believing that these animals will confer to the people some of their agility. The shepherds and the other persons who are away from home on Easter day eat willow or apple tree buds instead of anaphora. There’s the custom of knocking the eggs. It is believed that those who knock their eggs will see each other on the other world, after death. In the first day of Easter, eggs are only knocked with the top. On Monday they can be knocked top to the bottom and on the next days they can be knocked any way. The first ones to knock their eggs are the parents, one to the other, then the children to the parents and then the other relatives and friends. According to the tradition, the one whose egg cracks first is weaker and he will die quicker. He must give his egg to the winner; otherwise he will eat its egg rotten on the other world. Eggs are knocked until the third Easter day, until the “Ispas” or until the “Great Sunday”. 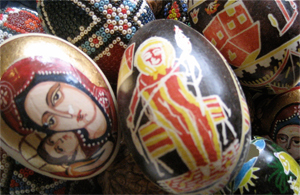 The most beautiful painted eggs are emptied of their content and used as decorations, being put on a rope and then hanged near the icons or in other places. It is supposed that a child born on Easter, at the time when bells ring, will be lucky all his life. The man that dies on the Easter day or in the next week is blessed, his soul heading straight to heaven, as the skies are believed to be opened at this time. On the Easter day one must not sleep, because it is said that he will be sleepy all year long. Also touching salt directly is not recommended, a belief stating that the hands of the one who does it will transpire during the summer. It is said that three candles burn in the sky during the three days of the Easter. In some regions (Bucovina, Transylvania), there is a tradition called “the wetting”. On Monday morning, the boys take a bucket of water and go to the houses of the unmarried girls. If they found them sleeping, the boys throw water on them. As it is believed that those girls will marry soon, they reward the boys who had wetted them by giving them the most beautiful decorated eggs and “pasca” or cake. In some places, the boys catch the girls when they go out from the house and take them to the fountain or to the river, where they wet them, even throwing them in the water. According to one of the legends, once upon a time a Christian girl was heading toward the market, carrying a basket of eggs, in order to sell them. On her way she met a pagan girl who wanted to buy her eggs, but lacked the appropriate money. The girl asked her to accompany her home, thus being able to pay. On their way the Christian girl tried to convert the pagan to her religion, but she resisted. “I will believe in Christ only if these eggs here will turn red.” To their amazement, that very thing happened and the girls fainted in fear. Some nearby boys noticed them and tried to revive them, splashing the girls with water. Upon their awakening, the girls offered the red eggs to the boys, as a thank you gift. On Monday and Tuesday the married couple go to their relatives, bringing them “pasca”, announcing them Christ’s revival. Usually, the younger people go to the oldert ones. In some regions, on the Friday before the Easter week, water springs are searched for, wells are built and cleaned. All these are done as it is believed that those springs and fountain will have plenty of water and won’t dry. The Good People’s Easter is celebrated a week after the Easter, on Monday, right after Thomas’ Sunday. In the Romanian tradition, the Good People are the ancient’s spirits, which live between the two worlds, where Saturday’s water spills into the Earth. The Good People are religious people and fast each time they should, according to the traditions. However they are not aware of the day when Easter is celebrated until they see remains of the painted eggs on the water, about eight days later. According to the legend, the Good People have a small stature, do not wear any kind of clothes and are covered by hair. The boys are taken care of by the mothers until they are able to live by themselves. After that, they live in isolation, fasting and praying along the other men. They meet with the women only one time each year, on Good People’s Easter. In gratitude for the dead, packages containing red painted eggs and pies are placed on the graves and candles are lighted. Easter is the most important celebration of the Romanian people and it is preceded by numerous preparations and rituals. 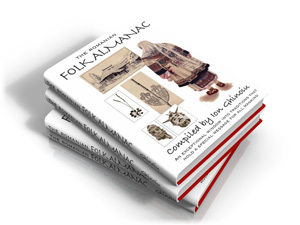 The book is structured around the 365 days of the year and folk traditions associated with those days or periods are detailed. This is an exceptional work for its clarity and in opening a window on unique living traditions still to be found in Romania.